The smart tube is a simple and practical device to create an hydration system from a water bottle. The tube comes with different sized caps that can work with different bottles, from the regular bottles of water this includes regular bottles of water from the supermarket and Nalgene wide mouthed bottles. The tube passes thru the cap and ends in a mouth bite valve similar to camelback systems, you have to bite sligthly for the water to flow. It is realtively spill free and will not leak unless pressure is applied to the bottle or the drinking tube. 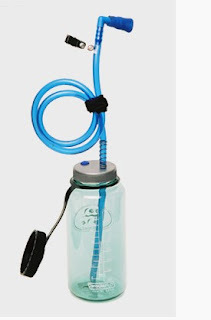 Besides not needing a water reservoir the smart tube makes the cleaning of your hydration system easier, since it's easier to clean a bottle than a water bladder you can also just buy a bottle of water anywhere, screw the tube and use it to drink water while running, hiking, bycicling or other outdoor activities. You can choose the size of the water bottle depending on your activity, location and time of the year. From our tests we could see that basically this worka as the Camelback hydration systems the only difference being that the reservoir of water is your choice. In conclusion a good idea to have a handsfree hydration system. You can read more and check out different models form the official website.